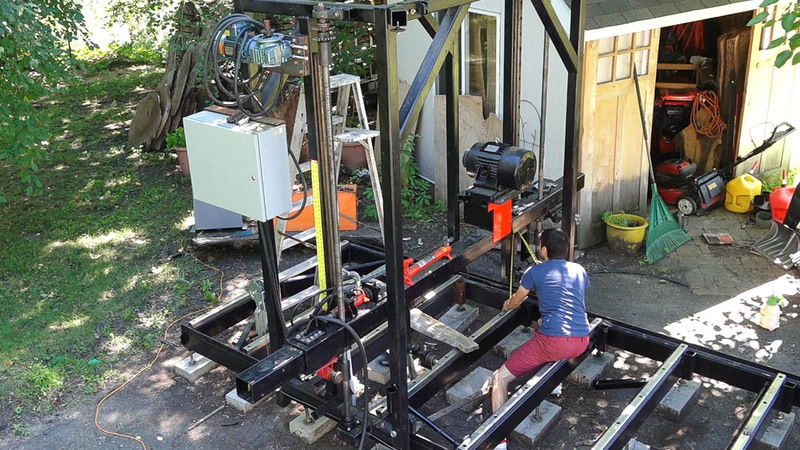 This time we’ll install the motor that will drive the sawhead lift and complete the sprocket installation that will route the chain from one lifting column to the other. I picked up this 3/4hp Eurodrive motor with a 15:1 gearbox to run the lift. It’s 3 phase which will allow me to control it with a VFD. I was really interested in having variable speed on the lift which would hopefully make setting the sawhead height visually a bit easier. 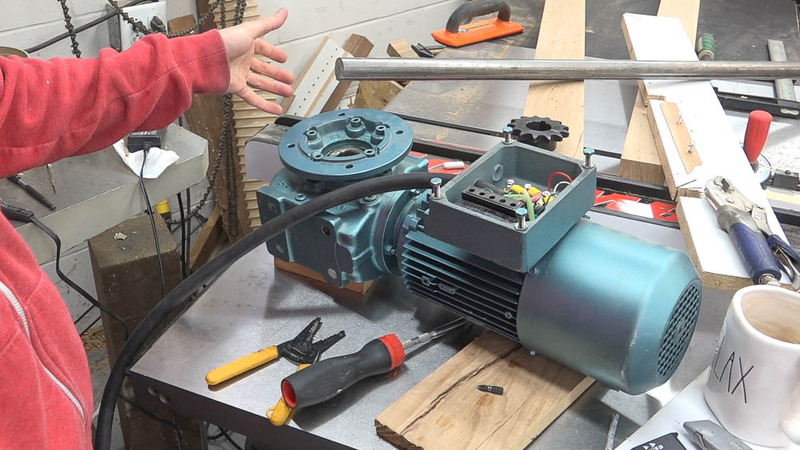 This motor also has a brake which locks the shaft when there is no power flowing to the motor. The VFD set went much easier than my prior experience with the larger one. Hooked up the input power and output to the motor and it worked right away. 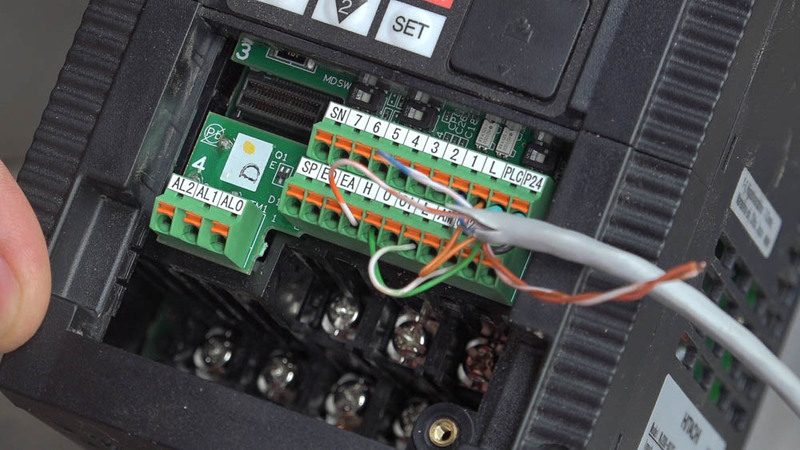 The external controls were easy to wire as well since these controls are quite common. I hooked up a rocker switch to control the motor’s direction and a potentiometer to control the motor’s speed. Direction of rotation is terminals 1 and 2 with L being ground. On the second row, L, O, and H control the speed. One issue I encountered was with the motor’s shaft bore. The specs I had for it listed the bore as 1-3/16 but in reality it is 30mm so my shaft stock was .006″ too big. To reduce the diameter, I mounted the shaft in my lathe and used an angle grinder to turn it down. 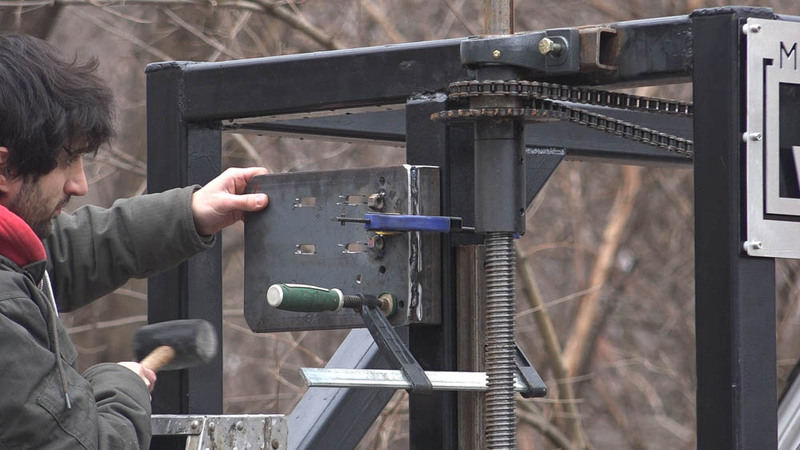 I used the tool rest as a steady and worked the shaft gradually down until it slide into the motor’s bore. With the motor wired and shafted up, next I can make a mount for it. 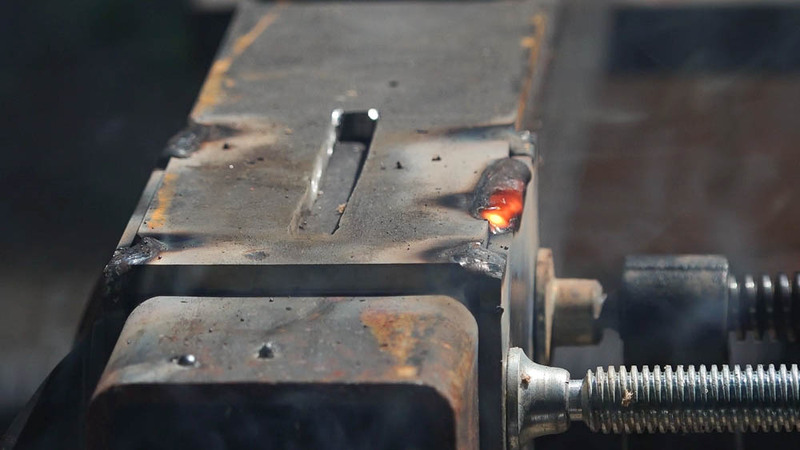 I welded a piece of 2×3 tube (an offcut from the log arch on my trailer) to a piece of 1/4″ plate. I drilled pairs of mounting holes 1.5″ apart. These will form slots which will allow the motor to move in order to tension the chain that will link it to the lifting rod. I welded a pair of nuts onto the mount which will allow a screw to push the motor along the slot. I got the mount in position and mounted it to the carriage with 4 bolts. I connected the linking chain and tensioned it a bit. The chain was a bit too long but I wanted to test the lift to see if it would even work. 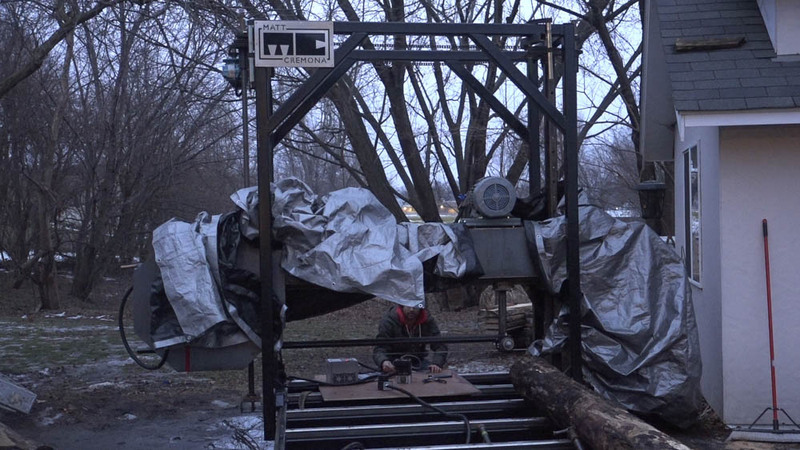 The feeling when I clicked the rocker over, the motor started spinning, and the sawhead began to rise was such an incredible moment – an 800lb sawhead rising into the air. Incredible. 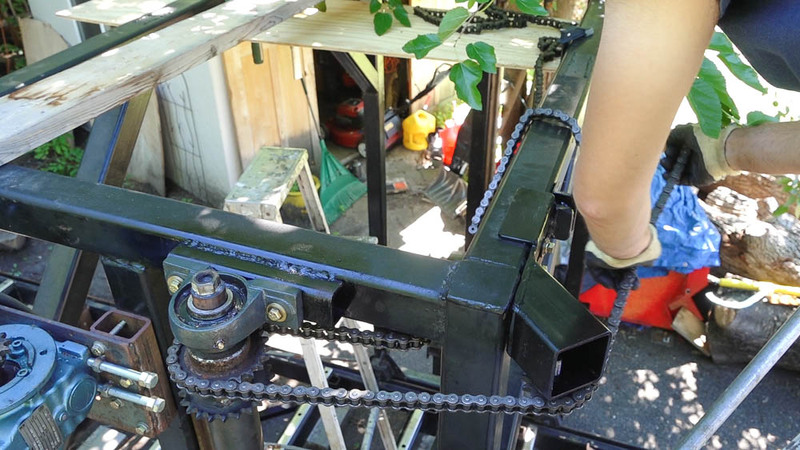 Now about a year and a half later, I’m going to finish up the linkage by routing the chain away from the middle of the carriage so that the motor can pass through the top of the carriage. 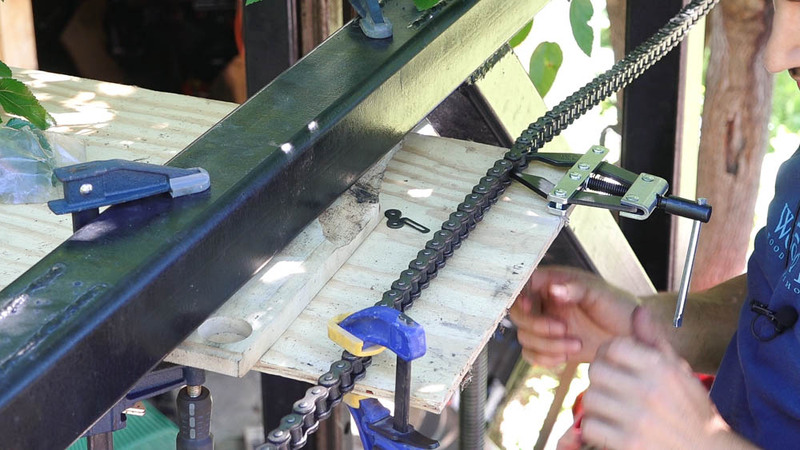 The tension will lap over the top beam of the carriage and using a slot, will be able to slide in and out to apply tension to the chain. 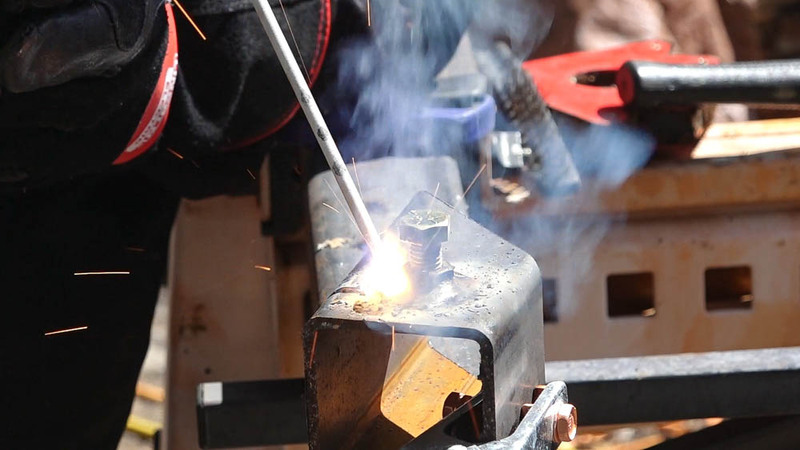 The idler will mount to a piece of 3×3 tube which is cut at 45 degrees to position the idler off the corner of the carriage. 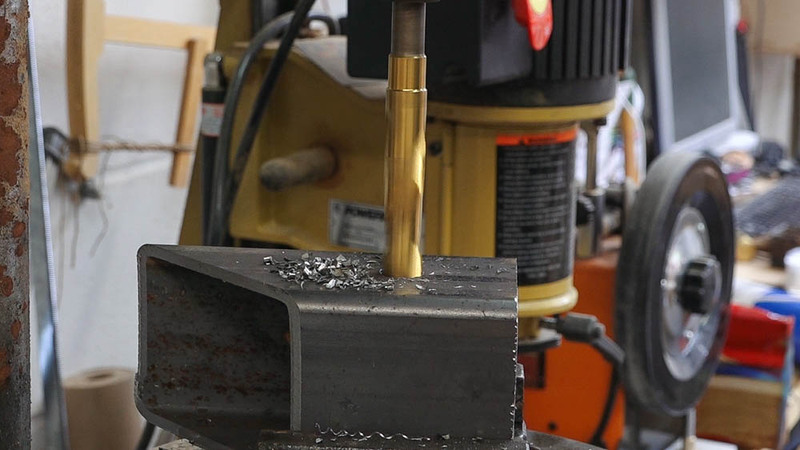 A clearance hole for a 1/2″ bolt is drilled through the tube. The tensioner mount is arranged around a piece of 3×3 tube and a .010″ shim is added so there is a little play which will make the component slide along the tube easier. 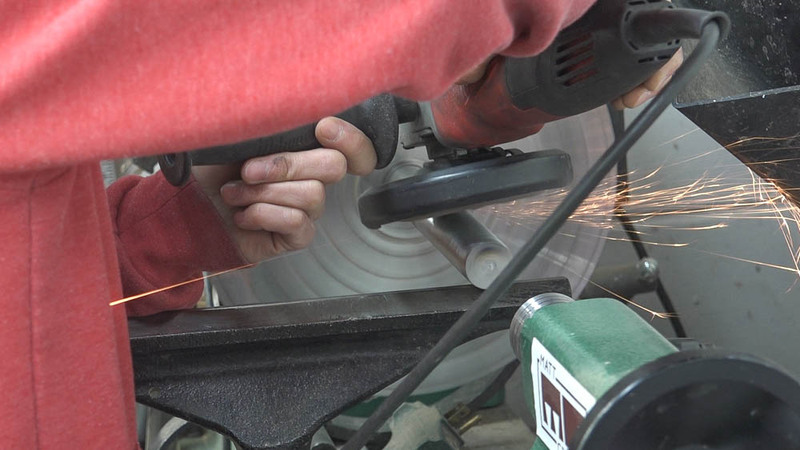 A nut is welded over the hole to hold the idler sprocket. 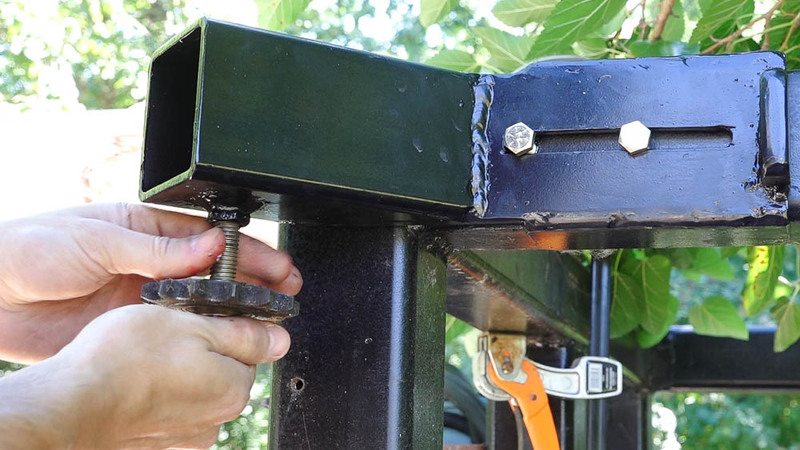 The tension screw mount is just a piece of 2×2 angle with a couple of mounting holes and a 1/2″ nut welded over a clearance hole. The tensioning component receives a block for the tension screw to push against. On the right side is the fixed idler component. I made this one similarly to the tensioner. 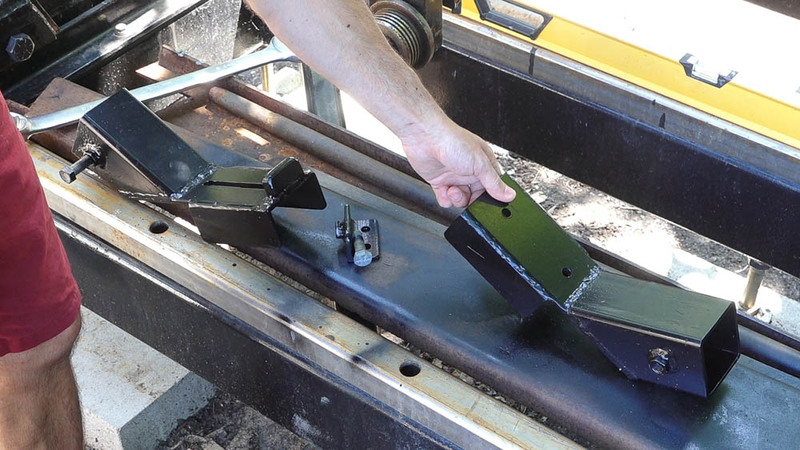 If the carriage wasn’t already painted, the angled tube could be welded directly to the top corner of the carriage. After some cleanup and paint, the parts are ready to be mounted to the carriage. 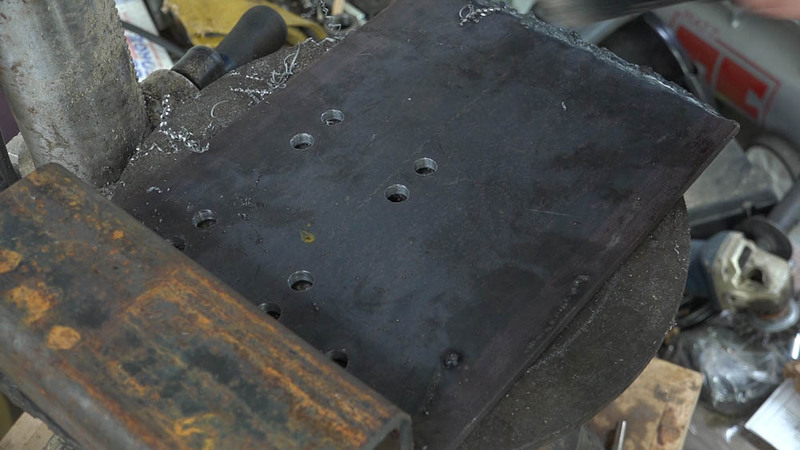 Starting off with the fixed outer idler – the hole locations are transferred to the carriage with a transfer punch and the holes are drilled and tapped. 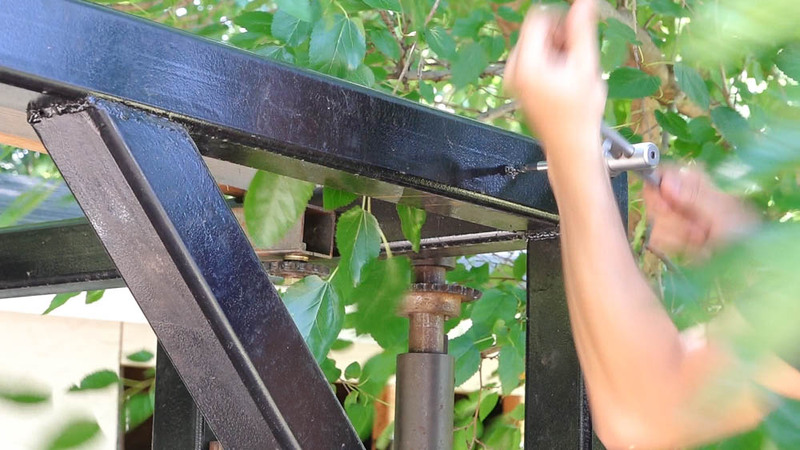 On the other side, the tensioner gets bolted to the carriage frame and the idler is installed into the nut. Next are the internal idlers that guide the chain along the inside face of the front of the carriage. 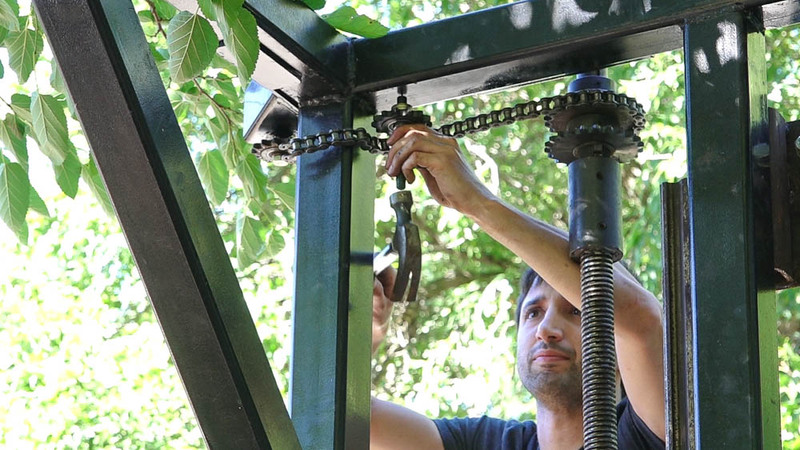 These need to be placed so that the chain runs as close to the carriage as possible while still allowing enough space for the chain to be put onto the sprocket. I’ll find a good spot with a section of chain as a guide, mark, drill, and tap the mounting hole. Before I install the linking chain, I take a moment to get the sawhead beam parallel to the bed. 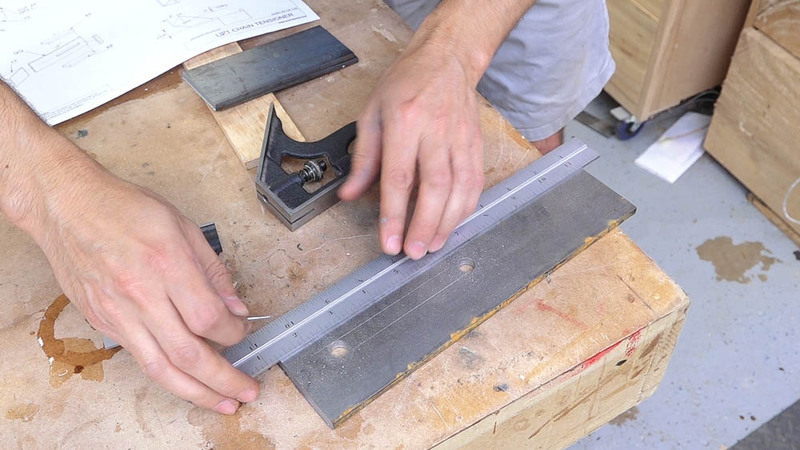 The guides will further refine the blade’s alignment to the bed but getting the beam parallel makes me feel better. 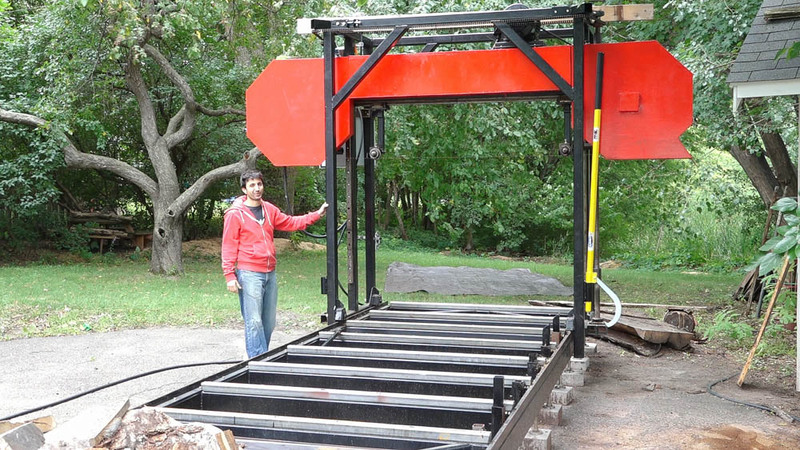 Either of the lifting columns can be operated manually to bring it into alignment. Now I can start running the chain through all the sprockets. 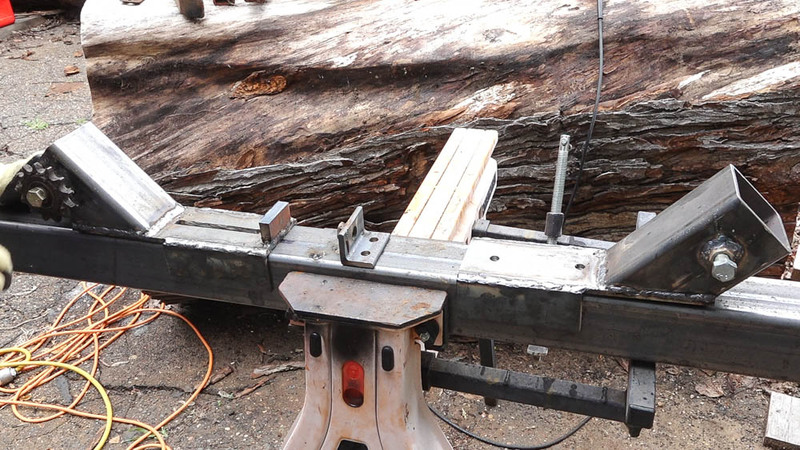 To make it a bit easier I clamped a bit of plywood to act as a floor to the carriage. This gave me a place to put the excess chain as I was working. Once I got the chain though all the sprockets, I could measure for the length I’d need to complete the linkage. 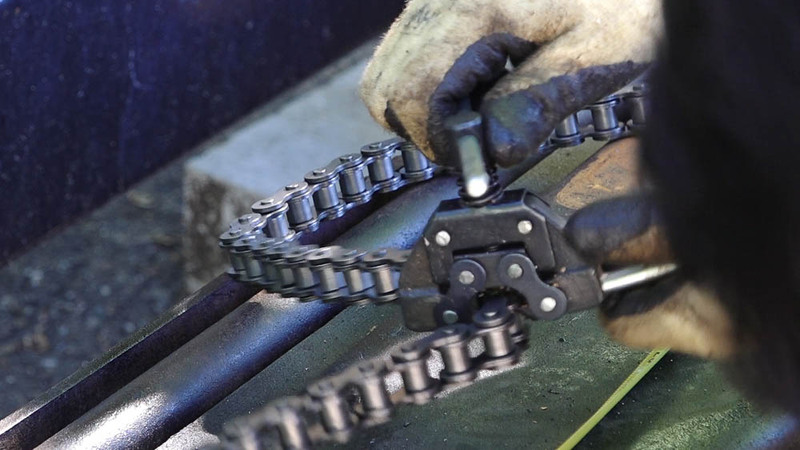 Using a chainbreaker and a punch, I get the additional length of roller chain that I need. The two chains get connected with a link. I link up the section on the drive side and then move to the middle to finish up the connection. 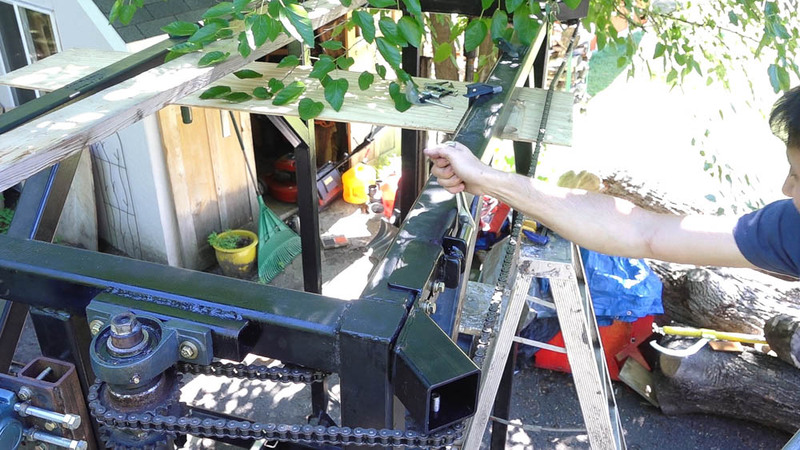 I used a chain puller to hold the two sides of the chain the right distance apart so I could slip in the connecting link. Having this plywood up here made this process so much easier since the weight of the chain was supported. Next the chain can be tensioned. At this point I’m just hoping that I’m not one link too long. 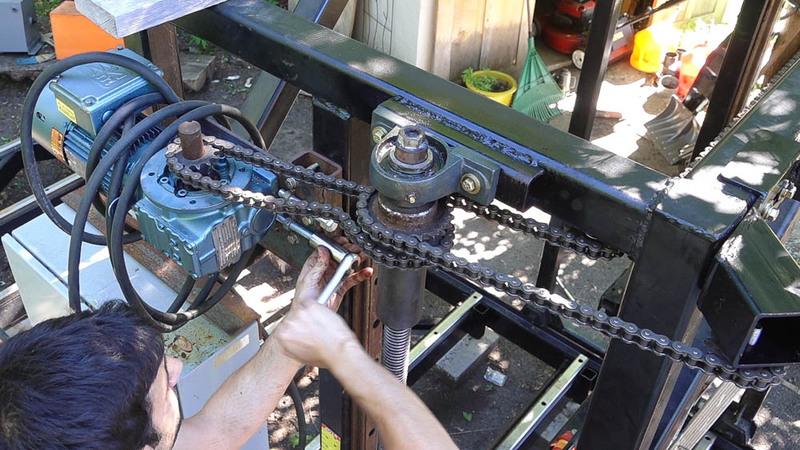 Lastly, the motor’s chain can be connected. 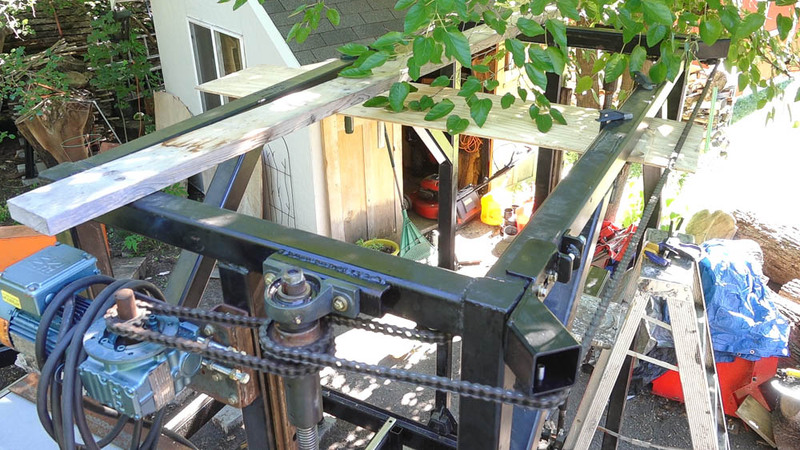 The tensioning bolts work well to push the motor through the mounting slots. I hopped down and turned the motor on and just like magic everything ran perfectly and the sawhead began to rise. 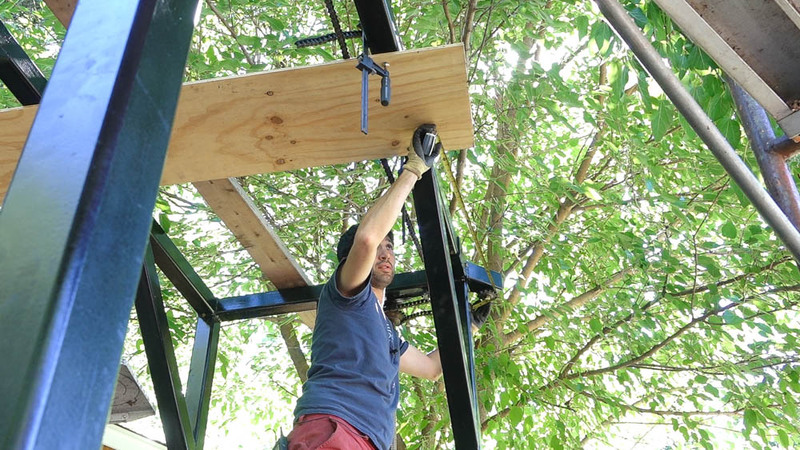 Now with the linkage installed, the sawhead can be raised to it’s maximum height! Not much left to do on the manual (ish) version of this mill. Next time we’ll add the lube system, track wipers, and a few last details. 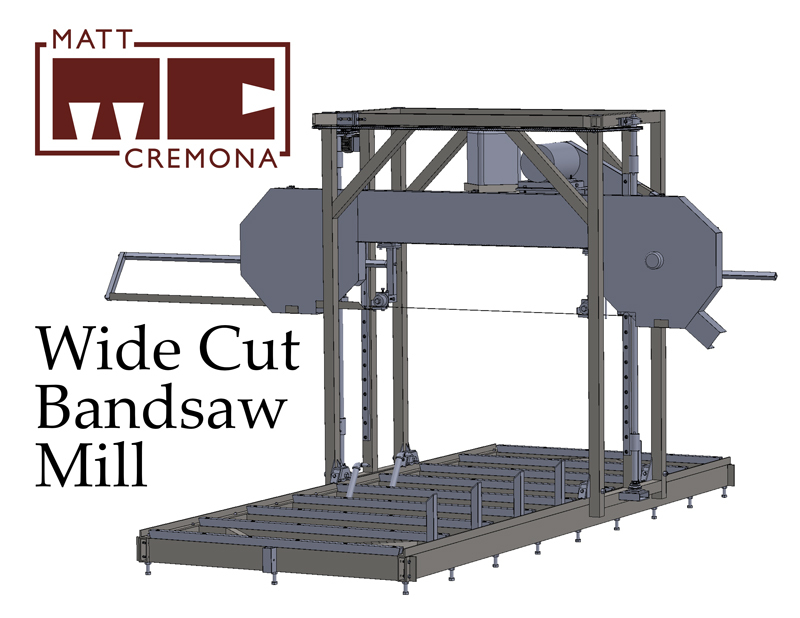 I would like to get some information on the cost of blueprints on sawmill builds. Hi Matt. What HP was the VFD controller for the lift motor? What horse power motor have you used?